Up until that point I had been sitting quietly on the couch with my friend Rachel from Texas and her non-English-speaking Georgian roommate, listening to the sounds of Georgian and trying to figure out which adjectives I would use to describe the language (still can’t peg it). When I finally decided to join the conversation, my point of entry was apparently the topic of an impromptu dance party. Before I knew it, the furniture was pushed aside, the lights were off, the stereo was blaring American pop music from a playlist on my iPod, and the three of us were dancing there in the darkness in a tiny living room in Tbilisi. After a few English songs, Rachel plugged in her laptop and the music suddenly changed from Michael Jackson to Georgian folk music. Not being particularly well-trained in Georgian folk dance, I decided to sit out for a little while and watch Rachel’s roommate, who had all of a sudden turned into a professional ballerina, tiptoeing gracefully around the room waving a scarf she had produced from her room. The next genre on our musical world tour was Indian music. As our dance troupe of two Americans and one Georgian showed off our best Bollywood moves in that tiny, darkened living room, I couldn’t help but smile. Moments like this are my favorite, when the world feels very small and nationality means nothing. Two thirds of the dance crew (Rachel and me), a day or two after the dance party. 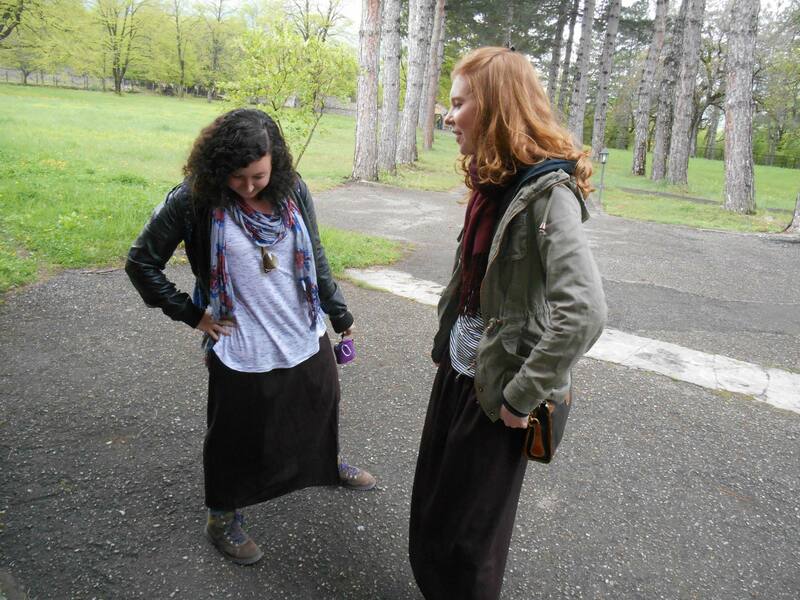 Our very stylish skirts were required for the church we had just visited. A few weeks ago, I woke up in the morning (okay, afternoon) with the sunlight streaming in through my window. I yawned lazily and stretched out in my bed. As I snuggled back into my pillow, I left completely relaxed and blissful due to the fact that, for the first time in as long as I could remember, I had NOTHING to do. No thesis to write, no assignments to submit, no emails to send, no class, no readings, not even any dirty laundry to wash. I was FREE. I smiled and my eyes began to close again as I began to drift off into a peaceful half-sleep. That’s when it happened. This thought would be the cause of many future sleepless nights. I had been so preoccupied with getting to this point in my life that when it finally came, I wasn’t exactly sure what this point in my life really was. Is this “real life”? Psh. Real life so far has consisted of me just wandering around Istanbul (and other parts of Turkey), sleeping every day until after noon, and generally having no purpose in life. The hours and hours (and hours and hours) I had spent writing papers and trying to finish my thesis had conditioned me to the feeling of always having some deadline hanging over my head, always some work that needs to be done. It gave my life structure in a way, I had achieved my perfect balance of procrastination and productivity. But now the work is gone and what used to be procrastination has become my way of life. The things I had always planned on doing for fun (like reading, blogging, and catching up on TV shows) became the new work that I procrastinated. This is part of the reason for my Internet silence, I very quickly shifted from being busy to being completely unmotivated. I’ve had a lot of fun this summer. I graduated from college. I traveled all over the country and hosted a few international guests. I learned a lot of Turkish and I even have several friends now who don’t speak any English, which is a very cool thing. I went to a linguistics summer school in Sweden and figured out what I want to do with my life. I even got a part-time job as an editor for a Turkish university publishing science articles in English. I’ll write all about these things soon, I can’t fit my whole summer into this post. Despite all the cool people and things that have been a part of my life during these past few months, I think that it’s maybe time to move on. At this point in my life, Turkey represents the strange gap I’m stuck in, somewhere between college and whatever comes next. I don’t want to leave, I could be happy here forever learning Turkish and eating delicious food and hanging out with my friends. But the rest of my life involves forward motion, and I can’t get my momentum back until I start moving again. But seriously, how am I ever going to leave this place? I apologize for the long gaps between my posts over the past few months. During the next few weeks, I plan to post stories that have happened during my time abroad this year, such as my two weeks in Sweden, an impromptu dance party in Tbilisi (Georgia), and the friendships I’ve developed in the Grand Bazaar. Stay tuned.